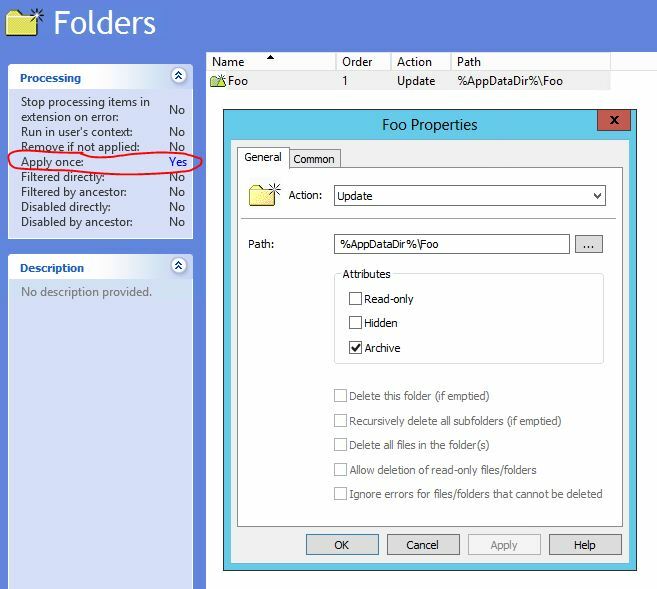 You deploy a new Group Policy Preferences (GPP) setting to create a folder on a workstation and specify the “Apply once and do not reapply” option. Unsurprisingly, this implies the GPP item will apply only once and will not run again! The registry string values (REG_SZ) shown correspond to the RunOnce settings. Instead of descriptive text these entries have (spectacularly unhelpful) GUID-style names. Ok, so armed with this information, how do you go about identifying the GUID-style name with your GPP setting? Don’t be led down the path of thinking the GUID-style name will match the GUID of your GPO – it doesn’t. That kind of make sense as a single GPO can have multiple GPP settings. The answer lies buried within the XML of the GPP setting. To get to the XML, right-click the GPP item within the GPO Editor and select All Tasks -> Display XML. Once you can see the XML look for the line starting with “FilterRunOnce” line. The value shown next to the “ID” is the one that corresponds to the registry entry. 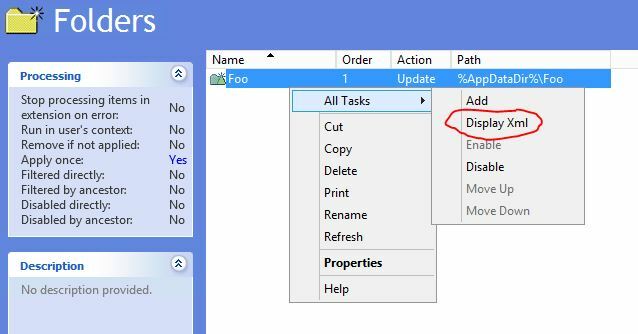 To get the GPP setting to re-apply to the problem workstation, simply delete the relevant string value from the registry and force the policy to re-apply (gpupdate /force). Posted by admin on April 22, 2014 at 2:09 pm under Active Directory, Group Policy.